Researchers have visualised changes made to RNA in the brain by administered drugs. A group of researchers from Kyoto University have successfully visualized RNA behaviour and its response to drugs within the living tissue brain of live mice by labeling specific RNA molecules with fluorescent probes. The team state that their study can potentially lead to faster, and more accurate screening processes for the discovery and development of new drugs. The opensource study is published in the journal Nucleic Acids Research. Previous studies show that RNA is a molecule that plays a key role within a living organism, holding information as to when, where and how much protein must be allocated, which is also responsible for controlling the biological reactions within a living cell. RNAs behave uniquely and are distributed unequally in each cell, existing more in some areas of the cell than others depending on environmental factors and cell conditions. In some cases, these chemical changes can put the cell’s health at risk due to RNA disruption. However, it is unclear as to how the distribution of RNA molecules is regulated in the cell, and what causes them to act abnormally. The current study introduced fluorescent probe within the brain of live mice, the team succeeded in visualizing targeted RNA in the cell nucleus. The researchers explain that this fluorescent probe emits varying intensities of light depending on RNA concentration levels enabling them to effectively quantitatively analyze RNA in the living body. The data findings show that the imaging technique quantitatively conveyed that the RNA behaviour in live tissue differed from that of a cultured cell when a drug was administered. The team hope that this new imaging technique can help reveal the natural state of RNA and allows them to observe the emergence and disappearance of RNA clusters in many types of species, including those that cannot be genetically engineered. The researchers next goal is to investigate differences of RNA activity in a live, single cell, and what regulates RNA activity. They also plan to compare healthy and unhealthy tissue to elucidate gene expression mechanisms caused by abnormal RNA activity. ECHO-liveFISH imaging of target RNA intranuclear foci in acute mouse brain tissues. 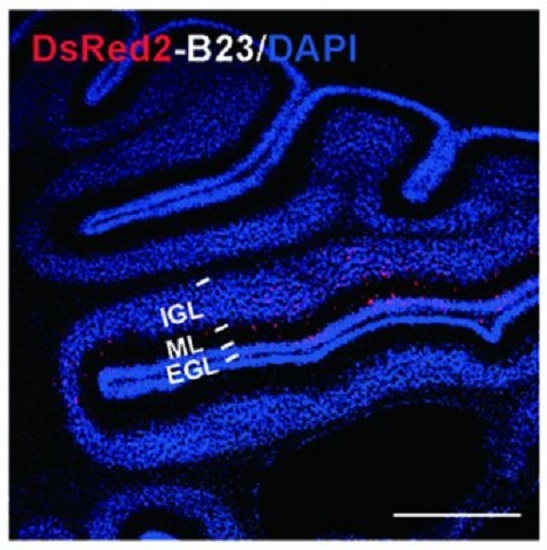 A confocal image of a DsRed2-B23 electroporated mouse cerebellum stained with a DsRed2-specific antibody (red) and DAPI (blue). ECHO-liveFISH: in vivo RNA labeling reveals dynamic regulation of nuclear RNA foci in living tissues. Wang et al 2015.